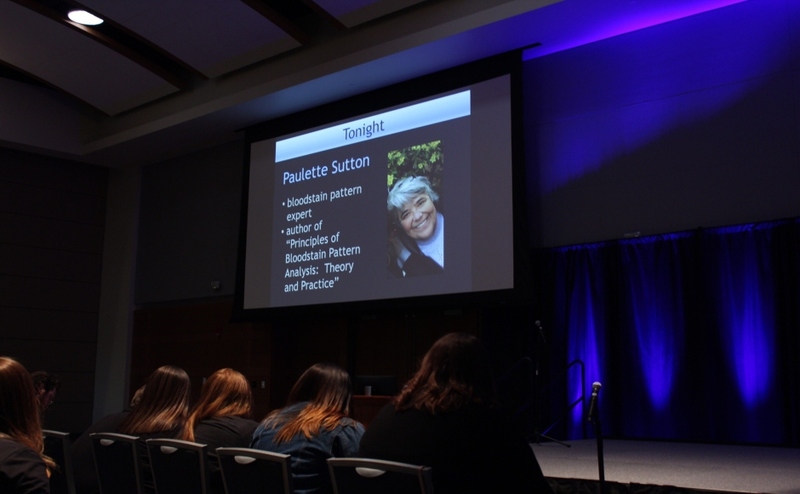 Internationally-recognized forensic scientist Paulette Sutton gave a lecture, titled “Murder in the Mountains… Or Was it Really Suicide?”, to students and community members Tuesday night at 6:30 p.m. in the Student Union Ballroom. The lecture, hosted by the Forensic Institute for Research and Education, better known as F.I.R.E., was part of the William M. Bass Legends in Forensic Science Lectureship, which has hosted a new speaker every semester since 2007. 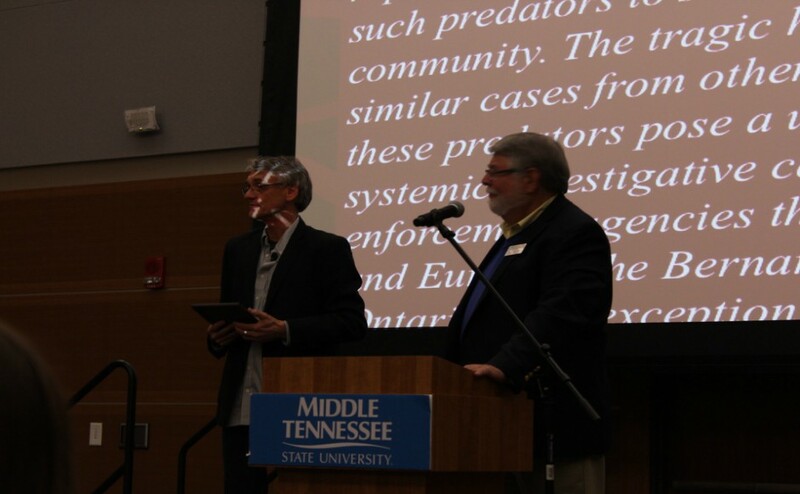 Hugh Berryman, the director of F.I.R.E., began the event by thanking other organizations and people on campus that made the lecture possible, including the Distinguished Lecture Committee, the Office of the University Provost, the College of Liberal Arts, the Middle Tennessee Forensic Science Society, and the Department of Criminal Justice Administration and the Department Sociology and Anthropology. Sutton is an expert in bloodstain analysis and used a case she worked as an example of what her job entails. She started by defining bloodstain patterns as a group of spatters created from the same activity. She used a PowerPoint presentation to show all of the crime scene photos she was given to solve the case. These images included measurements of bloodstain patterns that she said were not as exact as she would have liked, but they gave her the information she needed. The presentation also detailed the math involved in her process. Kasey Bowe, a senior Anthropology student and member of F.I.R.E, explained what she learned from the lecture. Anthropology major and F.I.R.E. member Hannah Newcomb detailed how the lecturer is chosen for these events. Sutton ended her lecture by thanking everyone for the invitation to speak. She then opened the floor to the audience for questions. The next William M. Bass Legends in Forensic Science Lecture will be held in the fall semester of 2019.